So I drew the above drawing to explain all of the patent laws, how they are related, and how they change. I drew this as a pyramid with the shorter laws at the top and the longer ones at the bottom. Next in the pyramid (working top to bottom) is the Patent Act. When our lawmakers in Congress (the Senate and the House of Representatives) want to make a new law, they write it, debate on it, and if they agree on it, then the new law becomes part of the United States Code. The United States Code is divided into smaller pieces called titles, parts, chapters, and sections. The Patent Act is the short name for our patent laws, which exist in Title 35 of the United States Code (35 USC for short). The version of the Patent Act that I use is about 88 pages long. So the Constitution says one sentence about how Congress can create patent laws, and Congress created 88 pages of patent laws. Next in the pyramid is the Patent Rules (also called patent regulations). Congress writes the laws, but different agencies of the government have to carry out those laws. The Federal Rules are the rules that the agencies write to help explain the laws and how they’ll be carried out. For patent laws, the USPTO writes the Patent Rules, and those appear in Title 37 of the Code of Federal Regulations (37 CFR for short). The version of the Patent Rules that I use is about 336 pages long. So we’ve gone from one sentence (Constitution) to 88 pages (Patent Act) to 336 pages (Patent Rules). 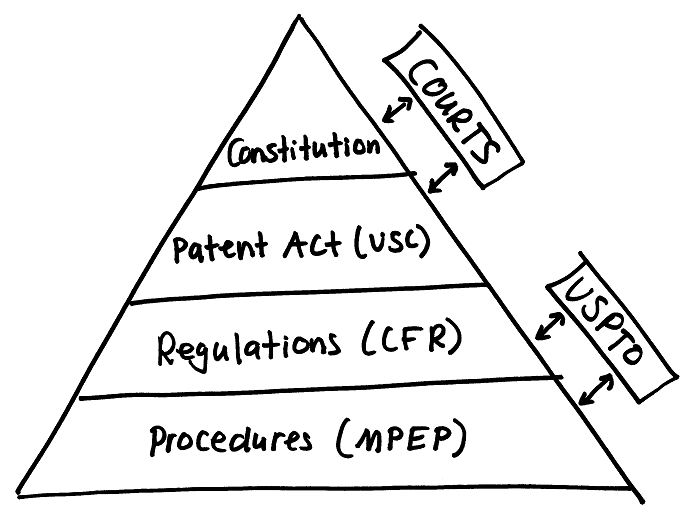 The bottom of the pyramid is the Manual of Patent Examining Procedure (MPEP). The MPEP was written by the USPTO for patent examiners to help them do their jobs. Most patent examiners are not lawyers. So the MPEP is designed to help them understand and apply patent law (the Constitution, the Patent Act, and the Patent Rules). The MPEP is the most frequently used reference book for patent examiners. So it is helpful for patent lawyers like me to know the MPEP. The version of the MPEP that I use is about 3000 pages long. So we’ve gone from one sentence (Constitution) to 88 pages (Patent Act) to 336 pages (Patent Rules) to 3000 pages (MPEP). My drawing could be better. And my explanation could be better. But again, I drew this for a child, so it’s a good place to start. The main point is that there are four types of patent laws: the Constitution, the Patent Act, the Patent Rules, and the MPEP. And patent practitioners like me have to do lots of reading to keep up with all of the changes. Ultimately, the Constitution’s patent clause is the most important patent law. But on a daily basis, the MPEP is the most important document for a patent lawyer. 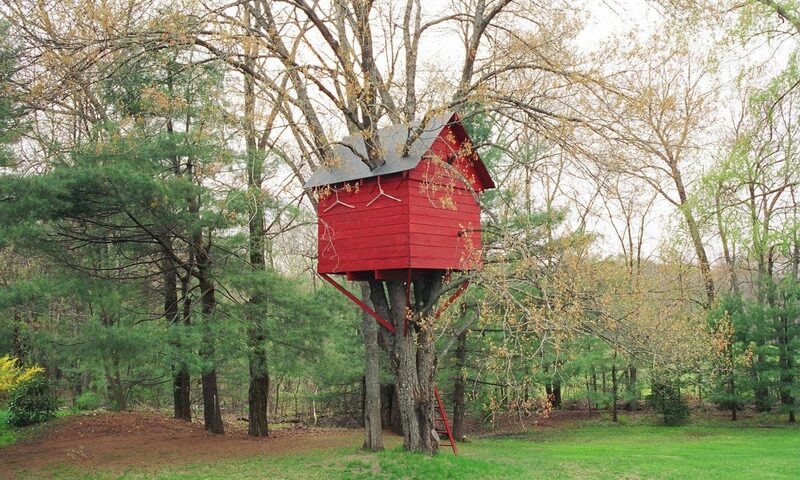 We have exchanged some emails but I lost your address. Could you email so I have it again. I would like to ask you a question. BTW, the patent on my puzzle was finally allowed last month.